We have some good news to share with you today on the Mighty Gunvolt Burst front! The playable character family in the game is increasing by one! Ekoro, the “elite” angel from the Gal*Gun series who made an appearance in the original Mighty Gunvolt game in 2014, is back for more! Her abilities have been reworked and upgraded for her appearance in Mighty Gunvolt Burst, and she’ll be primed and ready to go on July 27th for both the Nintendo Switch version and Nintendo 3DS version! Come see us at E3, Too Many Games, and Anime Expo! That’s right gang, we at Inti Creates are about to spend a lot time in the United States as we go to back to back weeks of conventions! Coming off the heels of our BitSummit announcement where we revealed Mighty Gunvolt Burst and Azure Striker Gunvolt: Striker Pack for Switch, we’re taking these (and perhaps some other goodies too!) on the road to both coasts of the US for fans to enjoy at Too Many Games (Philadelphia) and Anime Expo (Los Angeles)! We will also be at E3 prior to those, although without a booth presence. If any media outlets wish to speak with us at E3, or any of the other events for that matter please contact us via our press inquiry page to see if we can arrange a meeting! Now, let’s take a look at the events we’ll be exhibiting at! Stay tuned to this blog, our official Twitter, and our official Facebook for the latest on what we’ll be bringing to the shows, booth locations, panel times, and more! Hope to see you there! Azure Striker Gunvolt: Striker Pack – Coming to Nintendo Switch on August 31, 2017 for a price TBD. 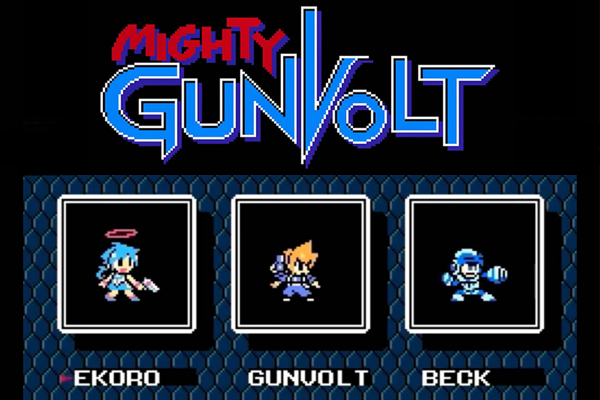 Let’s a have a look at each of these titles, starting with Mighty Gunvolt Burst. Happy Thanksgiving! Have Azure Striker Gunvolt 50% Off! To our dear friends in Brazil, the wait is finally over! We are very happy to announce that both Azure Striker Gunvolt and Mighty Gunvolt will be available in Brazil on the Nintendo 3DS eShop on Thursday February 19, 2015. Woo hoo! The big day is only 6 days away, so let’s get right down to the details! * Azure Striker Gunvolt will be available for 39.00 BRL and Mighty Gunvolt will be available for 10.00 BRL. The DLC for Mighty Gunvolt will also be available for 7.00 BRL. * There will not be a free download period for Mighty Gunvolt with the purchase of Azure Striker Gunvolt like there was previously available in North America. To make up for this, we have priced the games a bit lower compared to other regions. * The game will be in English only and be functionally the same as the North American version. Thank you all so much for supporting Gunvolt up until now! 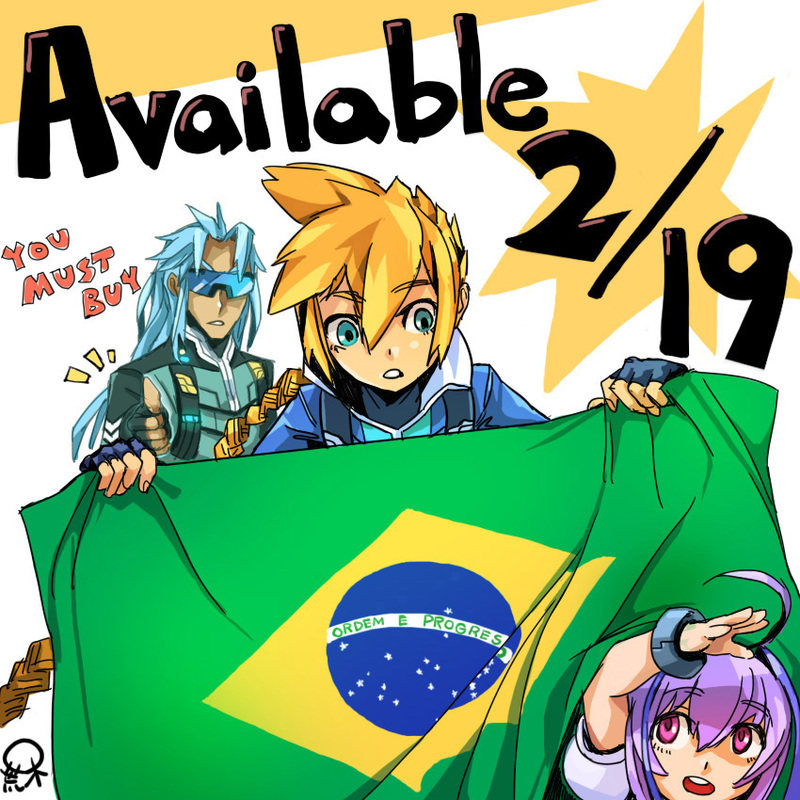 We hope that all of our friends in Brazil will have an awesome time with Azure Striker Gunvolt and Mighty Gunvolt! Press and Media inquiries (including requests for review copies) can be made here. Good news everyone! The DLC for MIGHTY GUNVOLT is now available on the Nintendo eShop! Have a look at the official MIGHTY GUNVOLT website to get a taste of what’s in store for you. Make sure you update your MIGHTY GUNVOLT game from the eShop so that you have access to the new DLC. And finally, for the last nugget of goodness from Gunvolt Festa, Azure Striker Gunvolt is now on sale on the Nintendo eShop for 30% off! If you missed out on the action before, or want to share the Gunvolt love with friends and loved ones, now is the time to do it. The sale will last until Monday Decemeber 15th. Thank you all for your continuous support! Happy zapping! Happy Thanksgiving from Inti Creates! Introducing Gunvolt Festa: Part 1! A hearty, healthy, and happy Thanksgiving to all of you from us here at Inti Creates! 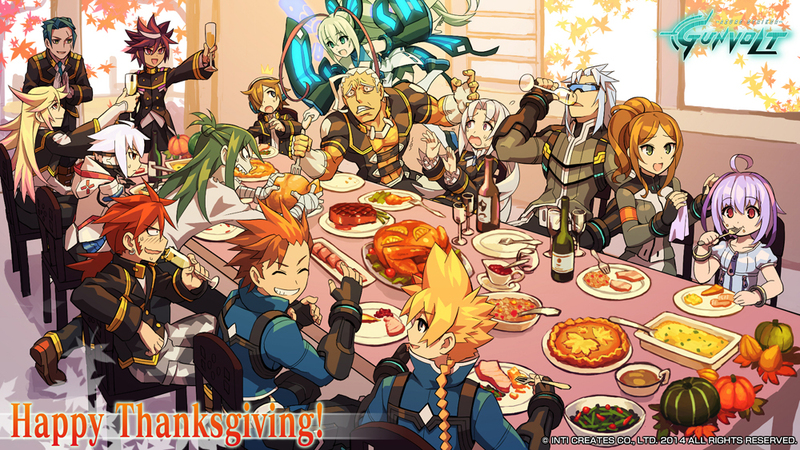 Since Thanksgiving is a time where you are supposed to give thanks, we wanted to thank our amazing fans with our own little festival stuffed full of Gunvolt goodness: Gunvolt Festa! Just what is Gunvolt Festa, you ask? Great question! This coming Friday at 9AM PT, Mighty Gunvolt goes on sale as a stand-alone game for $3.99. While that is awesome in of itself, we have lots of announcements in store for you to celebrate Gunvolt Festa! We here at Inti Creates are very happy to announce that Mighty Gunvolt will be receiving a version update and DLC package! 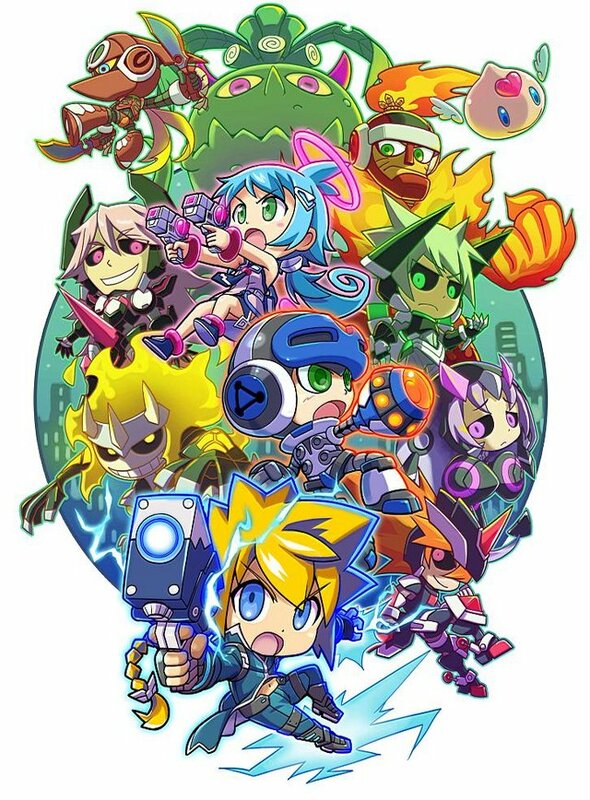 Mighty Gunvolt will go on sale as a standalone game on November 28th for $3.99 (USD). The early adoption campaign for Azure Striker Gunvolt which allows you to download Mighty Gunvolt for free will be ending at this time as well, so make sure you pick up Azure Striker Gunvolt by 8:59AM PT on the 28th if you want to receive Mighty Gunvolt for free! A release date for the version update and DLC package is coming very soon, so stay tuned for an update in regards to that. The update can be downloaded from the eShop free of charge when it is available. Now, let’s have a look at what is coming with the update and DLC!